I have a miter jack which I use to trim mitered corners for small boxes and I’ve found it to be very handy. But when I’m working with thicker stock, that requires a lot of material to be removed, using only a plane with the miter jack is slow. So I decided to build a miter jack saw. 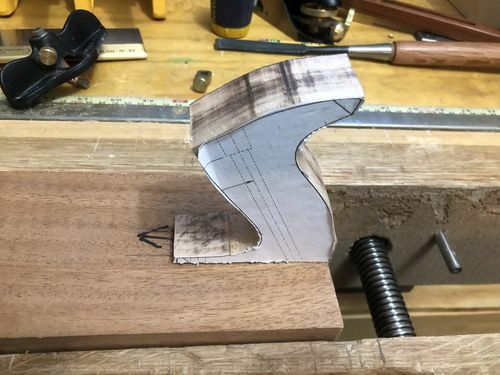 Rather than making a French-style miter jack saw I took a cue from Ron Aylor's tenon saw and decided to make a saw that worked more like a plane. It seemed more comfortable to use, plus it was easier to construct than making a true flush-cut saw, since my metalworking facilities are minimal. If you’re interested in seeing how a saw like this is used to cut tenons, difficult tenon shoulders made easy has pictures and description. I started with a chunk of African mahogany I got from Rockler with the though of someday making a plane body from it. I resawed off a quarter inch of thickness, as I was initially thinking of using the mahogany for the sole of the saw, but then found some ipe in the shorts bin at the local lumber yard, and knowing that ipe is hard and should wear reasonably well, decided to use that. The handle was made from another offcut from the shorts bin which was marked birch / maple? and which I think is birch. If it’s maple, it’s got some very dark heartwood. I used the pattern for a Stanley 5 and up plane tote from Lee Valley as my template, since I knew that fit my hand reasonably well. The handle is dovetailed into the saw body. It’s my first sliding dovetail, and came out reasonably tight. For a front knob I wanted something more but-like than knob-like, but after playing with that a little, decided I needed a taller knob. 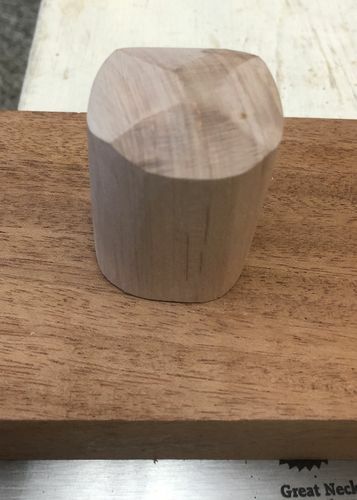 My first attempt had a crack in it which came apart as I was trying to turn a tenon on the end, but the second attempt worked. I also had some problems with the inserts. 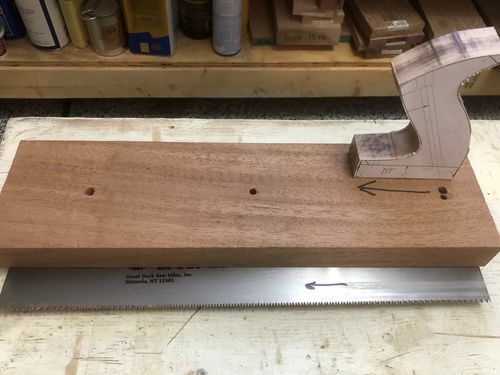 They don’t lock especially well into the mahogany, and the holes a friend drilled in the saw plate aren’t quite symmetrical, so when I drilled the holes with the saw plate on the wrong way, turning it around required plugging a hole and then redrilling it. Fortunately the mistake is hidden beneath the tote. Finish is a coat of BLO and paste wax. It should develop a nice patina with use. You did good, looks like a very useful tool and practical. Job well done. Dave, excellent job of tool making. Nice work Dave! Still don’t fully grasp it’s function but at least it’s well-made and looks good! Kenny, it’s basically a flush-cutting saw (well, about a quarter-inch from flush). To cut miters, you stick the board in a mitering clamp and slide the saw along the face of the clamp to saw off the end of the board. Or you can use it to cut tenons by stopping before you get all the way through. I think Kevin’s working on a video for Candy to show how it’s used. I’m apparently no good at explaining this year. Nice work, Dave. I would like one of these for tenons alone. They look very useful on the bench. It wasn’t a terribly complicated build. Even with putting the blade in the wrong way, and breaking a front knob, it was done in four days. Probably would’ve been two with no hiccups, or one if I build a few more. Looks to be a very usable tool. Good Job! This write up, with its multiple embedded links, is a treasure trove of hand tool WW information. I cant wait to wikisurf thru it when I have time. By the time I fully understand what you made I’ll be much more educated! Looks great, like it’s a pleasure to use. That looks like a really useful tool Dave. Great job! Dave, thanks for broadening our hand tool awareness…I’d be interested in seeing some action shots eventually. The usage for tenons is illustrated here . Looks great Dave. I’ve always just used my Japanese flush cut saw but I can certainly see how nice this would be to use. I’m sure it will become a favourite. Great idea Dave. Anything that makes things easier and more accurate is always welcome in the tool arsenal. John, you’re welcome. I learned a lot along the path to deciding to make this. Tony, no it won’t. But it might have a home in the plane till I’m still building. Or it’ll hang out with the miter jack and tenoning clamp (not yet built) somewhere. Tom, either I’ll get some action shots or Kevin will post some with his miter jack saw. Thanks, Sylvain! That’s a very useful link! I’ll add it to the post. Thanks, Paul. Saving nicks in the jack will be a help. But at some point I’ll probably make one of my own. But I have a table I need to build this year, and I’m expecting I’ll use this for all the tenons on it. Dave, I’m not sure about more accurate, given that the blade has a ton of set, but I filed away about half of the set, and I’ll probably end up with a better blade at some point. Or perhaps this will work just fine. But it’s a nice addition to the shop, and now I have an excuse to build the tenoning clamp / jack.